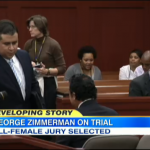 Dan appeared on Good Morning America this morning to discuss the results of the jury selection for the Zimmerman Trial. George Zimmerman is facing second-degree murder charges for the murder of Trayvon Martin. It is odd, as it rarely happens, that lawyers choose a single-gendered jury. Dan says, “I’ve been covering high-profile cases for 20-something years, I haven’t seen one in recent history. They have them. I just haven’t seen it. It’s definitely to have all of the jurors of one gender. I don’t buy into the notion, because you have women, therefore it means blank. I don’t think that makes sense. This is a diverse group of women. The question is going to be, back in the jury room, when they begin deliberating, does that change the dynamic? I don’t know. But there’s no question that in this case, prosecutors wanted men of color. The defense wanted white men. Neither got exactly what they were looking for.” Watch the segment here.